The Cavallo Western Built-Up Saddle Pad provides additional padding over the wither area that will adjust the position of a saddle that tips. It is used to balance a saddle that would otherwise incline to the fore. The unique Four-Density Solution arrests concussion within the pad. The high integrity foam remains thin to provide more room for your horse to move freely. * When using this pad, take care not to tilt the saddle too far back on the loins. 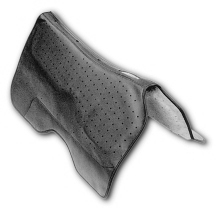 Additional padding over the wither area will adjust the position of a saddle that tips. It is used to balance a saddle that would otherwise incline to the fore. Take care not to tilt the saddle too far back on the loins. After hearing such rave reviews of your boots on the Horses in the Morning podcast, on the Horse Radio Network, I decided to try them for my Mustang Fez. I have tried various brands and styles of boots on different horses in the past with poor results. Fez came to me with pretty poor feet, and has improved slowly with trimming and natural movement. He is, however, still a bit ouchy on some of the rocky roads and trails that we ride in Northern California. He loves!!! his Cavallo Boots. I love how easy they are to get on and off. I was so pleased with the amazing personal service that I got when I called to discuss my sizing and use concerns when I was ready to purchase boots. Jenny was very attentive, knowledgable, and helpfull. I needed to send the first set back because Fez was on the line between 2 sizes. Again, the customer service was stellar. I look forward to many miles of trails with Fez in his new boots.